What does a complete real-life investigation look like? 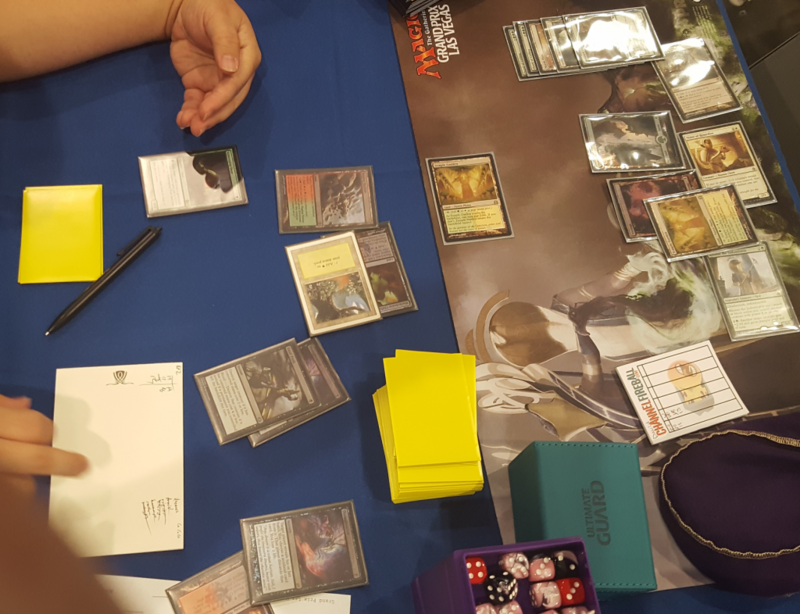 Today I’m showing you an interesting one I had to handle at GP Las Vegas. This was taking place in the Modern GP. The floor judge had separated the players and told me one was accusing the other of having played a Vizier of Remedies then taking it back to his hand. Before reading on, please take a few minutes to think about what you would do. What would you ask the players and how? What information can you extract from this board state? Keeping in mind cards might already have been moved a bit as the players were explaining their side, try to reconstruct the game and see where there might be a mismatch. Read on only if you struggle to recognize the cards from the pictures. AP on the left has Raging Ravine, Forest, Blackcleave Cliffs, Blood Crypt, 2 Thoughtseize, Fatal Push, 4 cards in hand. NAP on the right has 2 Temple Garden, Swamp, Forest, a hand of Vizier of Remedies, Gavony Township, Rhonas the Indomitable, a graveyard of 2 Chord of Calling, Marsh Flats, Verdant Catacombs, Devoted Druid. Now please read on only after thinking about it. Given that a player was accusing the other of cheating, I decided it was important to get written testimonies of what happened in the game. It’s turn 4 so I went with the full game, but this method can also work later by counting turns backwards. The way I chose was to talk to each player at the table while keeping the other player away. This makes it easy to look at cards, check facts (unpopular as it may be these days), and makes the discussion with the player natural. You can also ask how cards were manipulated, which might be important. NAP T1: Temple Garden tapped. AP T1: Bloodstained Mire fetching Blood Crypt, Thoughtseize taking Chord of Calling. NAP T2: Unspecified basic land, Devoted Druid. AP T2: Raging Ravine, Fatal Push of the Druid (timing unclear). NAP T3: The other basic land, Vizier of Remedies. AP T3: Land, Thoughtseize taking another Chord of Calling. AP T4: Land, Scavenging Ooze, call the judge. When was the Vizier on the table exactly? What proof do we have that it was cast? Which lands were tapped for it? Could it have been left on the table after a Thoughtseize? How were the players handling the cards? AP claimed that the Temple and another land were tapped (not sure which). Regarding the Thoughtseize, he said that NAP handed him the cards and that AP was giving them back as he wrote them. He was unclear if it was 1 by 1 or by multiples, but definitely not the whole hand at once. Last, I needed strategic considerations. AP said he kept Terminate up on turn 3 instead of casting Scavenging Ooze as NAP had the Vizier. I asked why he didn’t kill it sorcery speed to play around Chord, he said he was hoping to kill some better creature. Now for NAP’s story. As I had a basis my notes were briefer and I only cared about contradictions. The relevant one was NAP saying he didn’t cast anything on turn 3. About lands he also wasn’t sure of the order of basics but otherwise was consistent with AP. What was left was card handling and strategy. NAP had a similar story to AP regarding handling Thoughtseizes: handing all cards and getting them back by multiple groups. I asked how come he didn’t play anything on turn 3. He said that in this matchup vs Jund, creatures are vulnerable on the battlefield and he doesn’t feel much time pressure, so he tries to set up a turn where he can cast multiple and go off. Why not play that Rhonas the Indomitable that’s indestructible? NAP said that he was playing around Liliana of the Veil. Last, I didn’t ask about playing creatures early for the Gavony Township plan, but it was pretty obvious that it was a bad plan. With this, I had two pretty credible stories and no real reason to believe that one of the players was lying to me. In particular the stories hadn’t changed from the initial ones given by the floor judge (as a note, do try to keep the initial judge with you so that they can tell you if anything significant changed). The question remains: what really happened and what should I rule? Running the possibilities in my head, there was one scenario that matched both stories enough: that the Vizier was not cast, but on the second Thoughtseize the cards were handed back in a fashion that the Vizier stayed on the table a little bit longer than the other cards. It was still on the table when AP decided not to cast Scavenging Ooze but to keep Terminate up; NAP scooped the Vizier back to his hand (where it was) as he was starting his turn 4. So I ruled that this is what happened, no infraction, please proceed. In the end I thought there was a 50% chance that one of the players was lying (either the Vizier had indeed been played and then retracted or AP was falsely accusing NAP of doing that), but since that entailed a large chance of disqualifying the wrong player I stayed away from this option. So, how would you have gone about it yourself? Disagree about the method, the conclusion? Please leave a comment and let me know if you would like to see more of these. I would like to see more of these. After listening to each player’s story, I would have asked both of them “Why do you think your opponent claims what he claims?”. This way we would know not only AP’s strategic thinking, and NAP’s, but also what AP thinks NAP’s strategy was, and vice-versa. In practice in this scenario, does AP know that NAP thinks creatures are vulnerable on the battlefield in this match-up? Because if AP does, then it makes sense for NAP to *not* play Vizier, especially since AP knows pretty much all of NAP’s cards. This would be one extra piece of evidence backing NAP’s version, and making more likely the “Vizier left on the table after Thoughtseize” line of thinking. Monti is correct. AP would have to tap blood crypt to cast the 2nd thoughtseize on t3. Only leaving up raging ravine, forest. Unable to cast terminate. But possibly strategicly bluffing a lightning bolt. But I feel he would have divulged that information when questioned. It seems like NAP may have left cards revealed on the table from the Thoughtseize (I do this sometimes) either to allow AP extra time to write while I start my turn. Or as a courtesy “here, you don’t have to spend the time writing”. Seeing that NAP had 3 untapped lands and the fetches temple garden. Seems unlikely he would run out his combo piece only to get it killed, especially seeing 1 red up. Not playing Rhonas on 3 seems wrong, but his reasoning made sense. Should there be any concern to asking strategy questions, or pointing out different strategy paths while there is the chance the game could continue with no infraction? When asking these it will most likely with open questions (i.e. not answered by yes or no). There is little chance that the player will learn anything, especially when you ask about choices on previous turns. Moreover, in this instance there’s a significant chance that a player cheated – would you rather improve a player’s chances by 1% or skip the information you need to take the correct decision? I wonder, when did the Thoughtseize player cross out the Vizier? He clearly thought it was cast at some point, otherwise he wouldn’t have done it. Good point! I didn’t think to ask. If i´m not wrong, AP didn´t have the right mana for play the Terminate, if he played Thoughtseize he had no black mana available, just the forest and the Raging Ravine. The above comments are right that the land beneath the Forest is Blackcleave Cliffs, making it likely that my notes for turn 3 were wrong (they had lots of shorthand) and that BP played Cliffs untapped on turn 3 and the Forest on turn 4. The Blood Crypt got moved as part of the player explaining the game, it was actually always in play.